An old adage says that time and tide wait for none. BT More discovers a timepiece from Panerai which understands this. Success in a race is typically dependent on the skills of the sportsmen and the way they manage time. But when it isn't a solo performance, and the allies of the players are not just their team members but the unpredictable forces of nature, the utilisation of time definitely cannot be left to the ordinary ticking of the clock. A classic yacht race begins when all the vessels have been lined up at the start line between the buoys. But since these boats are guided by the winds and water, they are in constant motion - not sitting still at any point. Unlike other kinds of races, the challenge for the crew members aboard the yacht is to cross the start line only after the signal has been given; crossing the line early would lead to penalty, and maintaining a safe distance from it would put them at a disadvantage once the race begins. 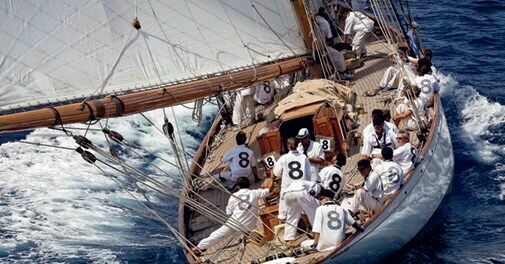 Yacht races, it's often believed, are won or lost at the start line. With its years of expertise in nautical horology, Officine Panerai has come up with a watch that measures this critical interval between the sounds of the warning gun and the start gun. 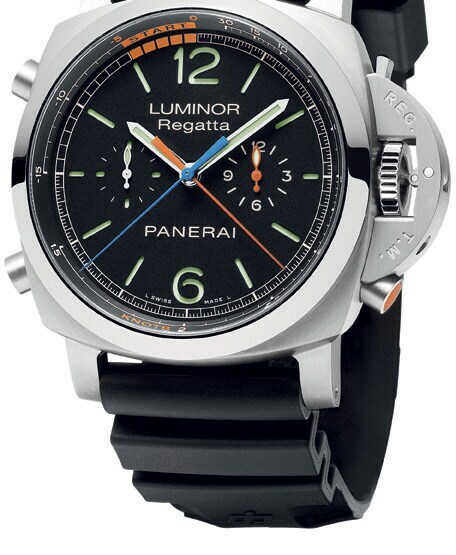 The Luminor 1950 Regatta 3 Days Chrono Flyback Titanio is fitted with the Regatta countdown function, specifically created for yacht racing starts. An orange push-button at four o'clock moves the central orange chronograph minute hand back one minute at a time, until it is at the correct position in relation to the length of the countdown. The chronograph is started after the warning signal is given, by pushing the chronograph stop/start button at 10 o'clock. The relative hands indicate the time left for the start, and then, when the countdown has finished, the time elapsed since the start of the race. The reset button, located at eight o'clock, ends the time measurement - returning all the chronograph hands to zero. Alternatively, if the watch is operated while its hands are moving, it activates the return-to-zero (flyback) function, thus enabling a new time interval to be measured immediately without operating the stop and reset buttons.